Glossary of Photographic Terms (F to I) – John's Cameras. f/ number This is a ratio of the lens’ focal length divided by the aperture diameter. It gives a measure of light transmittance independent of the lens focal length. f/5.6 (for example) on one lens will transmit the same amount of light as f/5.6 on any other lens. fascia A decorative covering over the front of the camera. film advance The means of winding the film on – usually a knob until the mid-1950s and then a lever until the late 1970s when it became an electric motor. film advance lever A lever used to advance the film one frame. film gate the rectangular opening inside the camera against which the film sits. It provides the sharp edges to the image. focal plane shutter a shutter consisting of either two cloth blinds or metal slats that sit just in front of the film and move to allow light to reach the film. focusing screen This is usually ground glass. In a plate camera, the glass is placed where the sensitive plate will later be and is used to display they image – upside down and reversed left to right. 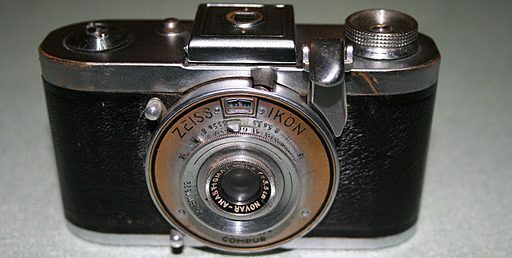 In a SLR camera, the focussing screen is immediately below the pentaprism and is viewed through the pentaprism with the image the correct way around. Focussing screens frequently include focus aids such as micro-prisms and split-image discs. frame counter Either counts how many pictures have been taken or counts how many are left on the roll. On many SLR cameras this is reset to zero when the back of the camera is opened. Fresnel screen This is a type of lens designed by the Frenchman Augustin-Jean Fresnel (pronounced Fray-nl). It is basically a normal lens cut into small sections to allow it to be made much thinner. It is used in focussing screens as a Fresnel screen will be as bright at the edges as it is in the centre. front-cell focussing Ideally, a lens should be focussed by moving the whole lens towards or away from the negative. When there is a shutter in-between the glass elements of the lens, this is mechanically difficult and expensive to make. Cheaper cameras just move the front element of the lens which has much the same focussing effect but reduces the quality of the image formed for close-up shots. FSU Former Soviet Union – refers to those republics that used to be a part of the (now defunct) Soviet Union. F synch This is a method of synchronising the firing of the flash bulb with the opening of the shutter. F means fast and the delay between firing the bulb and the opening of the shutter is very small allowing the bulb to reach maximum brightness as the shutter is fully open. Ground glass The focusing screen of SLR cameras in made from glass where the surface has been ground down to produce a matt surface. This allows the image to be seen. Half frame A camera that produces an image that is only half the size of a standard frame. With 120 film, half frame is 60 x 45 mm and with 35 mm film, half frame is 24 x 18 mm. helical focussing A focusing system where the lens is fitted in a screw thread and is focused by turning the lens. Hot shoe An accessory shoe fitted with flash contacts. hyperfocal distance This is the maximum range of focus the lens is capable of. It is found by setting the infinity mark on the focusing scale against the set aperture on the depth of field scale. image circle The circular image produced by a lens. It is always bigger than the negative or sensor. Incident light reading This technique uses a light meter to read the amount of light falling on the subject, rather than the more usual method of reading the amount of light reflected by the subject. Mostly used in portraiture. Infra-red Wave lengths of light that have a shorter wavelength than red light. It is invisible to the human eye but can form images with suitable film, giving different tonal values to normal film. Many older lenses have a red dot on the lens barrel to allow focusing to be adjusted for infra-red light. Iris diaphragm A series of interlocking blades that can be moved to make differing sizes of holes to adjust the lens aperture.